The pioneering Pothole-spotter trial has secured a prestigious industry award which recognises its ‘great potential’ in dealing with these highly visible road defects. The project, led by the Department for Transport (DfT), in partnership with Thurrock, York and Wiltshire councils and delivered by private-sector SMEs, Gaist and SOENECS, was named winner of the ‘Best Use of New Technology’ category at the Highways Awards 2017. The Pothole-spotter project and its learning will revolutionise the way councils undertake highways maintenance and how potholes and other road defects are identified and managed, reducing their number and paving the way for a high-performing local highway network fit for all road users. Launched in January, the system uses high-definition cameras, mounted to refuse collection vehicles (RCVs), buses and bikes to capture regular, detailed images of the same sections of the highways network. This rich data is analysed using intelligent software and the findings will be used to deepen councils’ understanding of how roads deteriorate. It will enable them to develop a long-term strategy for more effectively predicting and preventing potholes and other highways defects. To collect and analyse road condition data to improve highway authorities’ ability to find and fix issues. Enabling councils to utilise a more planned approach to highways maintenance rather than undertaking a ‘patch and mend approach’, will save councils’ and taxpayers’ money and potentially save lives thanks to better road conditions for all road users. The Department for Transport will consider how the use of the technology can provide authorities and other organisations with more real-time information to help identify a wider array of important features and possible issues, including cracks and other defects, signage, vegetation, debris and other characteristics. This will help inform planned long-term investments in road and other local highway infrastructure. The DfT will also examine how the use of this new technology - and making better use of data - can help create smarter environments to assist mobility, increase local economic opportunity and address local challenges. We were hosted at the wonderful Silo resturant for our first change of venue for six months. The food was wonderful, with the usual choice of vegtable, meat or fish options. Our tastebuds were overwhelmed, amongst other ingredients, by a mixture of asparagas, bream, mushrooms, goats cheese and Sea Buckthorn. The debate as usual was lively, but rather more 1-1 discussions that group dicussions, partly due to the accustics and partly due to other diners being in the resturant. Overall, a great night, with three new members in attendance. Our next dinner club will be our 1 year anniversary, look out for it! David. 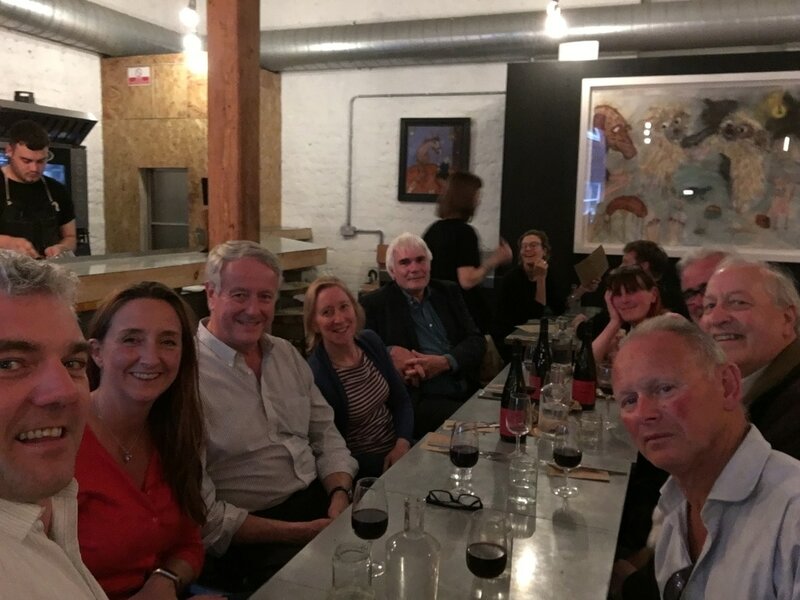 The launch of the Circular Economy Dinner Club, by David Greenfield from SOENECS and Linda O'Halloran from Thinking Development Consulting, was held at the Goldfinger Factory in Goldbourne Road, Notting Hill last night. Twenty five people from organisations as diverse as Futerra, Lloyds Bank, London Waste Recycling Board, Chatham House, UCL, Urban Farming, Folklabs, CupClub, Cogen and The Princes Trust attended. The venue was the Goldfinger Factory, which is an award-winning design, build and teaching platform centred around upcycling that creates bespoke furniture and interiors, whilst helping artisans and artisans- in- the- making become self-sustaining through craft and in turn saving materials from landfill. The food was locally sourced, organic and fresh and cooked by Panella with the wine being organic and in some case sulphate free. The Ale was made from waste bread. The evening centred on different circular economy topics, including fashion, food, big data, construction and behaviour change. Many discussions were had on how the Circular Economy could be embedded in the diverse group of individuals and organisations.